I've had my eye on this house ever since I saw it listed for sale last fall or winter. 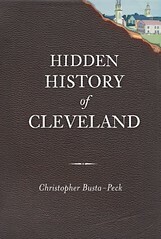 It's located at 1336 East 93rd Street, in Cleveland, Ohio - not so far from my job. 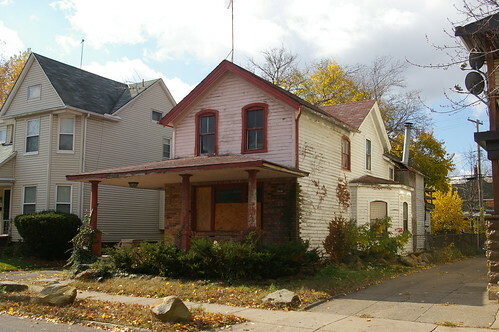 The house was built somewhat before the rest of the neighborhood, probably in the 1870s or 1880s, while the houses around it were built in the 1890s through 1920s. There are plenty of other houses similar to it, scattered throughout the city. There are probably even many that are in better shape than this one. The proportions of this one, to my eyes, are just right. I like that it retains the original galvanized steel half-round gutters. The exterior hasn't been covered with vinyl siding. The windows, with the exception of the one on the front of the house, appear to be original. Even the front porch, added later, feels appropriate - the columns feel light and well-balanced. The bay window on the side adds a nice bit of visual interest - it would stand out more with the trim on the windows painted to match the rest of the house. I should be more bothered by the brick façade, but I'm not. Perhaps this is because visually, it feels like it might peel right off. If this house was mine, I'd do away with the addition on the back - it doesn't appear to be in as good of condition as the rest of the house, and it would provide for a bit of a back yard. Recognize this Rocky River house? What lurks under the aluminum siding? 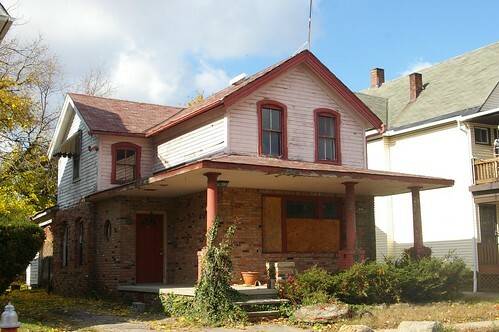 Save the Jesse Owens house!